I'm so excited to be heading off to Florida for a much-needed vacation (including sunshine and beach time) this week! Traveling to a warmer destination is making me re-evaluate packing with a more minimalistic approach in mind. The more I travel, the more I try and encourage myself to pack light by only using a carry-on suitcase and a backpack or large tote to carry my essentials. However, the one thing I find I overpack each and every time I travel is my toiletries. Thanks to the help of Stowaway Cosmetics I'm able to keep minimalism at the forefront when packing my makeup on trips! 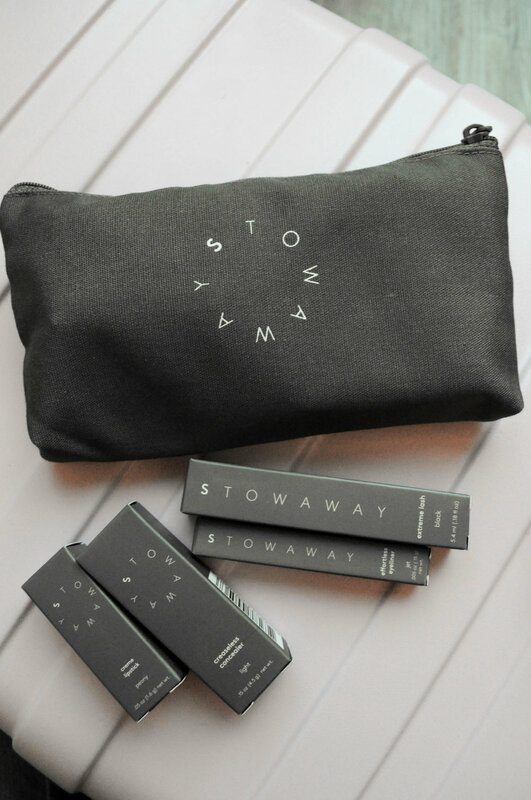 Stowaway cosmetics are for the lady on the go - whether you are traveling or going out, you don't have to worry about throwing a bulky makeup bag into a purse or suitcase. No matter your lifestyle, Stowaway products fit into every aspect of your busy life. I am also a huge fan of the fact all of their products use safe and paraben-free ingredients which often irritate the skin. As always, do a skin test (I recommend doing one on the inside of your arm) before applying but for someone with extremely sensitive skin, I have to say that Stowaway has passed my test! I received the Every Day Kit which consists of essentials in half the size all fitting inside a Stowaway zipper bag. The best part about creating your Every Day Kit is that you can customize the products to suit your skin type by selecting concealers suited to your skin color, preferable creme lipstick color (I selected a fun punchy coral called Peony), a cheek and lip rouge (gotta love a product with multiple uses) - I selected the Cantaloupe for a fun pop of color in the summer. You also have options for liquid eyeliner and the extreme lash mascara - probably my favorite product in the kit, I've yet to find a mascara that gives me so much volume and with a few extra coats you can transform your day look to evening-ready. I also received a mini brush perfect for applying blush and bronzer on the go instead of packing a long makeup brush that takes up so much room in a makeup bag. If you want to select kits designated for your lifestyle you can choose from prebuilt kits like: Fit in a Workout bag, Pack an Overnight Bag, Be Polished During Playdates, Look Effortless Running Errands, Go to the Beach, Be Sweet on the Hot Seat, Light Up the Room, Everyday Ease, Own the Office, Tackle the Big Meeting, Classic Beauty, Pretty in Pink, Fearless Beauty, Aggressively Natural, Berry Bold, Naturally Made and Everyday Lips. If you're a bride, they even have kits for you! Another awesome perk to Stowaway is their advocacy for recycling makeup containers. They refer to "Right Sizing" a lot which means that Stowaway products are created in smaller sizes so all of your products can be finished before they go to waste aka expire. Stowaway has a unique program for those that finish their makeup products to recycle the containers and get rewarded for it. Once you've finished up your Stowaway products you can print out a prepaid shipping label from their site and send Stowaway the finished up products, Stowaway will then be responsible for recycling the makeup and you will receive $5 in Stowaway credit for every 3 products you return, talk about an awesome perk! 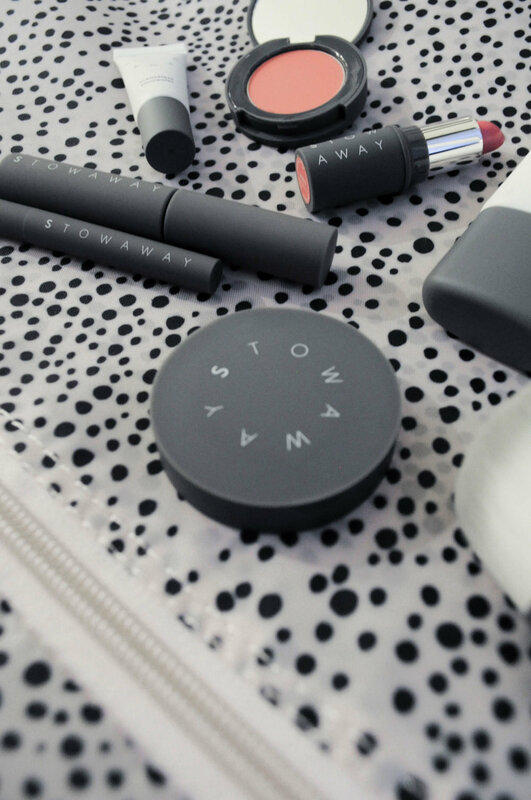 Stowaway products have revolutionized the way I think about makeup in a more minimalistic way when I'm on the go and have definitely eased my stress with fitting a bulky makeup bag into my luggage when traveling. After all, when you really think about it, on a trip, all you really need is the essentials. S/O to Stowaway Cosmetics for collaborating on this post!